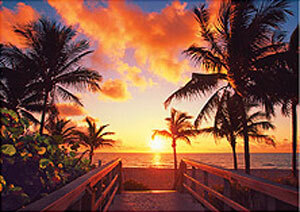 Hollywood, Florida is a culturally diverse, seaside city centrally located in Broward County. The city of Hollywood shares boundaries with the neighboring cities of Fort Lauderdale, Dania, Davie, and Cooper City along the north, and Pembroke Pines, Miramar, and Hallandale bordering the south. Hollywood is a rapidly growing city, with a population of almost 140,000 for its 30 square mile area. This beach city is the twelfth largest in the state of Florida, and is the principal city for the South Florida region, which develops the tri-county of Palm Beach-Broward-Miami metropolitan area. Neighborhoods in Hollywood include Arapahoe Farms, Beverly Park, Boulevard Heights, Carriage Hills, Driftwood Acres, East Lake, Emerald Hills, Emerald Point, Highland Gardens, Hillcrest, Hollywood Lakes, Lake Eden, Oak Ridge, Park Side, Playland Estates, Royal Poinciana, Sheridan Oaks, and Washington Park. Moving On Up™ opened in Hollywood, Florida in 1996. and is a member of the Hollywood Chamber of Commerce. Our Hollywood location moves local inner city moves from Fort Myers to Weston, up the coast to Fort Pierce, and everywhere in between. If you're moving locally in the Tri-County area, give us a ring at (954) 924-1522 for mover rates and to learn more about our monthly moving offers. Planning to visit Hollywood Beach before you move? Check out the city of Hollywood's unofficial visitor guide, the Hollywood Gazette to help you plan your move. We also suggest you visit the City of Hollywood official site to learn more about the community, as well as business and employment opportunities. Moving On Up™ is conveniently located in East Hollywood, off of Sheridan Street and Dixie Highway, just west of Federal Highway and the beaches. Contact your local moving company now at (954) 924-1522 to schedule an in-home estimate and up-to-date home inventory. Request your moving quote online to book your move now.